These are just some of the shocking allegations in the State Capture Report. 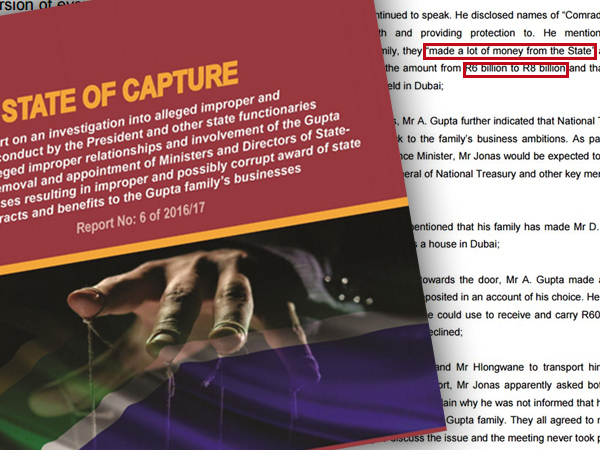 Among the shocking allegations contained in the State Capture Report is the claim by Mcebisi Jonas that the Guptas told him that they had made the president’s son, Duduzane, a billionaire. The 355-page report was released by the office of the Public Protector on Wednesday. The report states: “As part of the offer to become a Finance Minister, Mr Jonas would be expected to remove the current Director General of National Treasury and other key members of Executive Management." They also allegedly said that they made R6 billion from the state, but the brothers, Ajay, Atul and Rajesh wanted to increase that sum to a hefty R8 billion. Jonas has been seen as a whistleblower since he confirmed in March that he was offered the job of finance minister by the controversial Gupta family in October 2015, two months before president Zuma removed Nhlanhla Nene from his post and replaced him with little-known ANC back-bencher, David Des van Rooyen. Zuma and Van Rooyen, now the minister of co-operative governance, failed in their bid to halt the release of the report, signed and finalised by the previous public protector, adv. Thuli Madonsela, before her term ended on the 14 October. After dismissing Van Rooyen’s bid, Zuma withdraw his interdict in the North Gauteng High Court to stall the release of the report this morning and judges ordered the public protector to release the report by 5 pm today. Earlier newspaper reports suggesting that the Gupta brothers had offered Jonas R600 000 in cash and R600 million in instalments if he accepted the position as finance minister and assisted them in increasing their wealth is also alleged in the report. Madonsela also found that telephone records supported Jonas’ claims.